Sometimes during the summer, all I want to eat is vegetables. 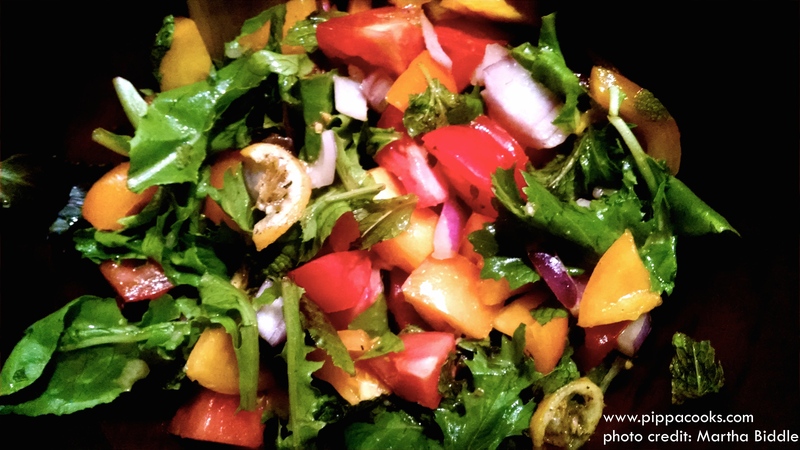 Red peppers, tomatoes, onions, carrots, cucumbers…. Sometimes I juice them and drink them all day long, and other times I make a big salad. 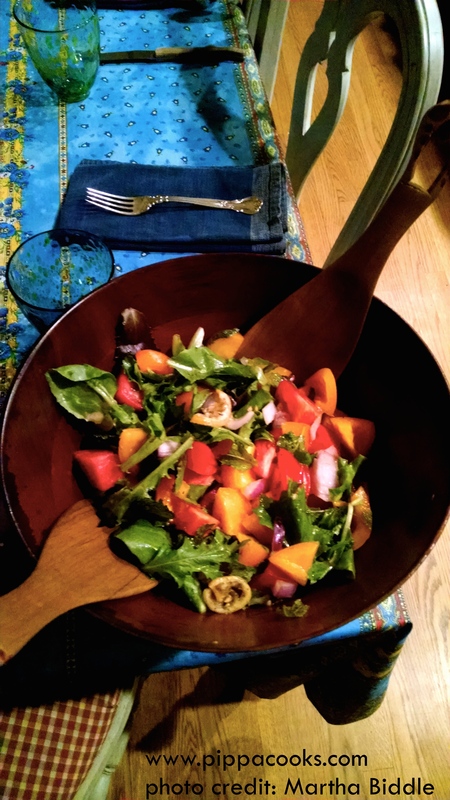 This salad was pictured on the front of the August 2014 Bon Appetit, but theirs utilized cherry tomatoes, and I used big, farm fresh heirloom tomatoes from a farm near my house. Another difference was their salad dressing. Only after glancing at the picture, deciding I wanted to make it, collecting what I thought were the ingredients, and beginning to assemble it, did I realize that their dressing recipe called for pomegranate molasses. While my family prides themselves on their well stocked pantry, we absolutely did not have any pomegranate molasses, nor had my mom ever heard of it. So instead of making their molasses-and-oil fruity dressing, I ad-libbed and made up my own orange juice and honey version. I am partial to sweet vinaigrettes, as the sugar cuts the acidity. I enjoyed this salad with my family on a hot summer evening. Preheat the oven to 350 degrees. Immerse the sliced lemons in boiling water for 3 minutes. Drain, then pat dry. Combine the sugar and oil in a medium boil. Add lemons and toss to coat. Roast on a baking sheet covered in tinfoil for easy cleaning for 20-25 minutes; depending on your oven it will take varying times for the lemons to caramelize. Remove and let cool. Add the greens to a large salad boil. Core the tomatoes, and cut into approx. 1-inch cubes, and add to bowl. add onions, and top with mint and lemons. To make the dressing, add all ingredients except olive oil to a blender. Blend on high for 10 seconds, or until just combined. Add the olive oil and pulse until thick. Drizzle the dressing over the salad and toss if desired. This salad was inspired by a Bon Appétit recipe from the August 2014 issue.